Originally published in The Rye City Review. Andrew Dapolite grabbed third place in the Spot News Photo category of the New York Press Association’s 2015 Better Newspaper Contest. The NYPA, a trade organization for weekly newspapers in the state, holds a spring convention each year in Saratoga Springs, New York. Dapolite’s photograph, which ran on the front page of the Aug. 14, 2015 issue, captures Scott Yandrasevich, the former Rye Golf Club general manager, on his lonely walk into Westchester County Supreme Court in White Plains. The judge who scored the entries commented, “You can see the look of shame on the face of this man! He’s a busted individual and his demeanor shows. Photographer did a fine job capturing this photo. 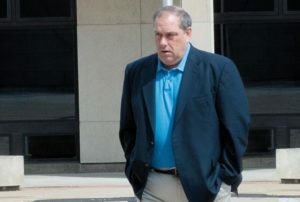 Good job.”Yandrasevich was charged with stealing $271,120 from Rye Golf Club, and after failing to make restitution, was handcuffed and taken into custody. He was convicted of grand larceny and falsifying documents, and is currently serving a one- to three- year sentence in Altona Correctional Facility. Dapolite first joined the Review in February 2015 as a staff photographer and contributing writer. A graduate of SUNY Oneonta, where he studied Mass Communications, Dapolite served as editor for the documentary film, “Language of the Unheard” which premiered at the Cannes Film Festival in France, while receiving accolades from 11 other film festivals around the world. He also has worked extensively in the field of television across many major networks.